There are various crimes in North Carolina that are considered property crimes. Breaking and entering is the one that is probably most often thought of. However, the property crime that probably occurs the most, even if it’s not necessarily reported or charged, occurs when one person intentionally does damage to the property of another person. In North Carolina, when someone does damage to the property of another, they can be charged with injury to personal property or injury to real property. Personal property, by law, covers a wide range of items; vehicles, jewelry, and furniture are just a few examples. Generally, personal property is considered to be any property that is moveable. Injury to personal property is a misdemeanor in North Carolina, and is governed by North Carolina General Statute 14-160. If the damage to the property is valued at $200, this crime will be punished as a Class 2 misdemeanor. If the damage to the property is valued above $200, this crime will be punished as a Class 1 misdemeanor. A commonly occurring example of injury to personal property would be keying someone’s car. Real property, by law, is land and anything affixed to that land. This would include plants or vegetation planted and any structure affixed to that land. Your house would be considered real property as well as all the fixtures, which includes, the doors, windows, ceiling fans, etc. The furniture in the house, however, is considered personal property. 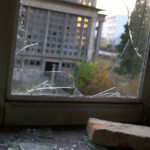 A commonly occurring example of injury to real property would be breaking a window in someone’s house. If you are charged with a crime in North Carolina, even if that crime seems minor, there may be some serious consequences attached to it. Because of this, you should contact a criminal defense attorney as soon as you can.